It's been a while! In the last month, I haven't been very productive in my designing, but I do have something new for you today! We are gearing up for Halloween in my house. The kids are talking up their costumes (at least the one that talks...), and are getting excited for the night of treats. 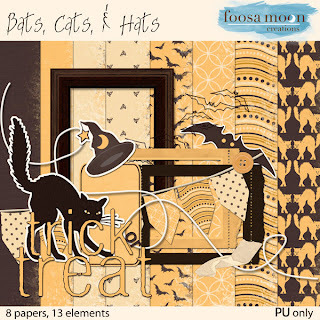 In honor of Halloween, I put together this little kit and want to give it away as a freebie! On a related note, I will be pulling down some of my freebie links from this summer. Most of them were created for design challenges, and since the challenges are long over it's time to pull them down. So get 'em while they're still available! Thank you so much for this post. I want to let you know that I posted a link to your blog in CBH Digital Scrapbooking Freebies, under the Page 3 post on Oct. 20, 2011. Thanks again. Thanks for the cute Halloween kit! These are sooo cute! Nicely done! !